"Darcy's Daily Dose of Inspiration" is an inspirational book and guide to help teach everyone how to deal with everyday life and to achieve incredible success. The book was created with great passion and a love for helping others, by film and television actress, philanthropist and social media influencer, Darcy Donavan. This inspirational guide came about from the requests of Ms. Donavan's fans. Darcy's inspirational messages have not only changed people's lives for the better, but have helped save people from suicide, depression and losing hope in their life or in themselves. The book is a labor of LOVE whose goal is to guide each and every reader to create inspiring thoughts and actions to move them forward to where they want to be in life. Ms. Donavan's millions of worldwide fans continue to enjoy her positive messages and many have shared words of thanks that are a testament to Darcy's caring advice, humor and heart. Her fans have spoken and after years of blood, sweat and tears; the book is finally here for all to be inspired and to help change their lives for the better. This campaign is meant to spread hope, joy and positivity full circle. Not only will the reader grow from the contents and messages in the book, but by purchasing a package today, they will also be giving back to three deserving charities in need. This is the most ambitious philanthropic project that Ms. Donavan has created to date and she will need everyone's help to bring the project into full fruition. A portion of all proceeds will go to help the incredible and unique charities listed below. Please support and come along with Darcy on her journey as she shares her knowledge and also gives back in every way that she is able to. 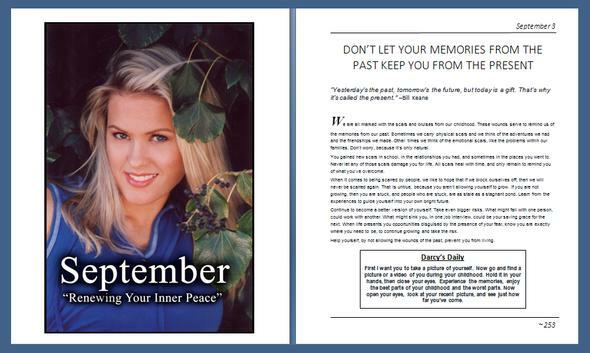 Through nearly 380 pages, with 12 full color photographs, daily inspirational messages and bonus guides, this journey into Darcy's thought provoking world provides an intimate glimpse of her insightful messages that will bring humor, practical advice and positive strategies to all who read it. We urge you to make a contribution that will not only help you the reader, but also help inspire others while generously giving to these amazingly well deserving charities. The more that we can procure, the more that we can help. See all the amazing charities that "Darcy's Daily Dose of Inspiration" will be helping below. IF YOU NEED ANY HELP WITH YOUR ORDER, CALL THE DARCY DONAVAN INSPIRATIONAL BOOK HELP LINE AT: (818)654-4553 EXT. 144. Wildlife Waystation: Located in the Angeles National Forest, in Sylmar, The Wildlife Waystation takes in all kinds of exotic animals that have been left destitute. The animals come from various environments from animals that have made it through animal testing, mistreated performance animals and even wild animals that cannot be safely reintroduced to the wild. The Valley View Vaulters: Located in Lake View Terrace and Long Beach California, the amazing duo Rick and Virginia Hawthorne run the center that works with severely handicapped children teaching them how to vault on horseback, and perform in front of cheering audiences. The Executive Director and head trainer, Rick Hawthorne has a remarkable story of survival that inspired him to create this charity. Protect.org: Located in Knoxville, Tennessee and helping children all over the world, the National Association to Protect is a national pro-child, anti-crime membership association that works to protect children from physical, sexual, and emotional abuse. The organization also makes an effort to locate and hire veterans and war hero's to help with the cause in getting these children to safety and taking predators off the streets. Included within the campaign is a bonus promotional raffle created to further reward and thank everyone for their participation in the project. Every $10 dollar purchase will grant the purchaser one entry into the raffle. As the campaign funding increases, so will the prizes that will be rewarded. See the raffle prize chart below and be sure to purchase a package to have your name entered into the drawing. The larger the package you buy, the more tickets you get, it is the luck of the draw and anyone could be a winner.